Github uses Linguist, a Ruby library, to help detect which programming language is in a given file. Recently, an issue was filed that indicated that Linguist incorrectly classifies Mercury (a programming language) files as Objective-c since they both use the same extension (.m). Linguist’s primary method for language detection is a file’s extension - a method that fell short for Mercury. If Mercury were added to Linguist, then there would be two languages with the same extension - and this is where things get interesting. If two languages share the same extension, or the file does not have an extension, Linguist has 3 methods for guessing the language. First it checks if the file has a shebang (#!/bin/sh). If there is no shebang the second method it uses is a set of heuristics. For instance, if the file includes the “:-” token it concludes that the contents are prologue code, or if “defun” is present it’s common lisp. If it still hasn’t found a match the third method it uses is a Bayesian classifier. Roughly speaking the classifier iterates over all of a file’s tokens, and for each token determines the probability that it is present in each programming language. Subsequently, it sums all those probabilities, sorts the results, and returns an array of language-probability pairs (e.g [[‘Ruby’, 0.8], [‘Python’, 0.2]]). I wondered how logistic regression, support vector machines or even clustering algorithms would help in classifying a given file. As I dived into the data I realized that the descriptive statistics on tokens, and even ascii faces, would be nearly as interesting as their predictive power. Thus, this post will summarize the descriptive statistics, while in my next post I’ll cover using tokens to predict a file’s programming language. First, a list of common programming tokens (eg: ; , . ( ), etc) was created - tokens that would be found in many of the 10 languages of interest. Using those tokens I created a tokenizer that would output an object with the keys being tokens and their values being the number of times that the token occurred in the file. Base 10 numbers, hex numbers, strings (double quotes) and ‘characters’ (single quotes) were treated as 4 different token types. This was done so the number 8 was not treated as a different token from the number 44 (they are both tokenized as “numbers”). Each of the 100 repositories was traversed and non binary files were tokenized, with each file’s total token count stored in Redis’ sorted set data structure (sorted by number of occurrences). Using a sorted set made it trivial to retrieve the 1000 most common tokens from all 100 repositories. Each file was then re-tokenize, but only tokens that were present in the 1,000 most common token list were counted. A data set was created that included information on 65,804 files from 100 different repos. Along with the token data, the following data was also recorded: 1) the file’s extension, 2) it’s path within the repository, 3) it’s shebang, if present and 4) the token count for the first 250 most common tokens (I decided to limit my analysis on a smaller number of tokens for the first round of analysis). Finally, the counts for each token were converted to the ratio that that token occurred relative to the total occurrences. of all tokens (e.g. # of periods/total number of all tokens). The absolute number of tokens per file would be skewed by large files, which have more tokens. All statistics were carried out using R. Welch Two Sample t-tests were used to compare groups. While the top 1,000 tokens, by occurrence were recorded, only the top 20 are presented in Table 1 (see here for the top 1,000). Not surprisingly numbers are the most prevalent token, with commas coming a very close second. Interestingly, and what sparked my interest in ascii smiley faces, is that there are slightly more right parentheses than left. While the contents of strings were ignored, the contents of comments were not. Seeing as most (all?) of the analyzed languages require parenthesis to be balanced I presumed that the imbalance might be caused by ascii smiley faces in comments. Interestingly, hexidecimal numbers were the 6th most common token despite rarely being used outside of c. While hex numbers are used extensively in CSS, I only classified numbers that started with ‘x’ as being hex, which precluded the hex numbers in CSS from being included. The top 20 tokens, by occurrence in aggregate (across 65,804 files). Table 2 shows the top 20 tokens and their ratios (token/all tokens in a given file) in 16 different file types. Not surprisingly JSON files lead the pack for double quoted strings, curly brackets, colons and commas. Likewise, Clojure leads by having the highest proportion of parentheses. The right arrow -> occurred most often in Php, C and Haskell. Finally, square brackets were very prevalent in Objective-C. The ratio of a specific tokens, relative to all tokens in a file, by file type. Only the top 16 file types are present in this table - there is a very long tail of file types. I restricted this table to file types that are relatively abundant in this dataset. Eighty percent of c files analyzed were found in the Linux repository, so it made sense to focus on Linux specifically. In Linux c comments I found 631 smiley faces and 73 frowns. In linux the most prevalent smiley faces was `:-)` followed by `:)` (See Table 3.). The first value is the number of times the ascii faces appears, relative to other tokens, while the value in brackets is the total number of times that it appears in all files. Linux c files are a subset of the c files. Despite including 100 different repositories, Linux source files represented 30% of all files in this analysis. Ideally, the number of files from each repository, and language, would be balanced. One approach would be to randomly select a numerically identical subset of files from each language. While this approach might be valid statistically it wouldn’t produce descriptive statistics on each repository, just a subset of files within each repository. Alternatively Linux could be excluded from the analysis since the number of files it contains is an outlier, relative to the other repositories. It is not surprising that ratios of token types can differ dramatically between different languages, however, I was surprised that several tokens (parenthesis, square & curly brackets) did not occur equally. While smiley faces can account for part of this discrepancy, they most likely do not account for all of it. Viewing Table 2 we can start to see some patterns and differences in token ratios that might help to predict a file’s language. For instance, JSON has very different token ratios than C. In the next article I will explore the power that tokens have in predicting which programming language is being used in a given file. In a previous article I explored ng-repeat, it’s implementation, and how to create a custom repeater. In this article I’ll first delve into the inner workings of ngView and then walk through the creation of an “ngMultiView” directive. To get the most out of this article you’ll need an intermediate understanding of creating directives (via the previous article on ng-repeat and reading the the AngularJS directive guide). In the process of understanding the code behind ngView I came across two undocumented attributes: “onload” and “autoscroll”. The onload attribute can take any Angular expression and will execute it every time the view changes. Autoscroll uses the $autoScroll service and scrolls to a specific element based on the current value of $location.hash(). Finally, near the very end of the directive, after link(currentScope) is called the '$viewContentLoaded' is emitted within the current scope - an event which you can use within your controller. Below is a revised version of the above example that includes the onload attribute. In order to understand ngView, I think it’s useful to create a simplified version of it. Below is ngViewLite, a version of ngView that does not include scope cleanup or animations, but is otherwise identical to ngView. First, we bind a function update to the $routeChangeSuccess; when the route changes, update will be called. Right after attaching the function to the event we immediately call update() to load the initial contents into the view. The update function checks if there is a defined template for the current route, if so it proceeds by calling the linker function, passing in a new scope, and a callback function. The callback function’s only parameter is the cloned element, whose html will be replaced with the route’s current template. The cloned element is then appended to div with the ng-view-lite attribute. Afterwhich we remove the previous contents from the view. Finally, the template must be compiled ($compile(clone.contents())) and a new scope is injected into it (link(newScope)). In between those two steps we check if the current route has an associated controller: if so we instantiate the controller with the newScope and the local variables from the current route. ngView works well, but what if you want multiple views to change according the url? According to the documentation ngView can only be used once within an application. To accomplish our ngMultiView we’ll slightly modify ngView and create an Angular value (MultiViewPaths) to hold the mapping between urls, views, controllers and templates. Within update: grab the portion of the URL after the hash (in the code this portion is just called url). Using the url variable, and the panel, we can lookup the corresponding controller and template from the MultiViewPaths value. Once we have the controller and template, ngMultiView works almost identically to ngView. Our ngMultiView is very basic, it doesn’t take into account parameters being passed through urls, nor does it deal with scope cleanup, or animations. If you need more functionality I’d recommend starting with the $routes service and modifying it to accommodate multiple views. Creating custom directives can be intimidating at first. There’s a lot of jargon to overcome, and many little nuances. However, once those are overcome it becomes relatively easy to alter existing directives or create your own. In my previous article I discussed the benefits of using dependency injection to make code more testable and modular. In this article I’ll focus on using promises within an AngularJS application. This article assume some prior knowledge of promises (a good intro on promises and AngularJS’ official documentation). Promises can be used to unnest asynchronous functions and allows one to chain multiple functions together - increasing readability and making individual functions, within the chain, more reusable. In addition to increasing readability promises can help with error handling, progress updates, and AngularJS templates. If fetchData is called and an exception is raised in transformData() or saveToIndexDB(), it will trigger the final error callback. // will result in this error callback being called. While adding try-catch made getDataFromServer() less elegant, it makes it more robust and easier to use as the first in a chain of promises. A promise can only be resolved, or rejected, once. To provide progress updates, which may happen zero or more times, a promise also includes a notify callback (introduced in AngularJS 1.2+). Notify could be used to provide incremental progress updates on a long running asynchronous task. Below is an example of a long running function, processLotsOfData(), that uses notify to provide progress updates. Using the notify function, we can make many updates to the $scope’s progress variable before processLotsOfData is resolved (finished), making notify ideal for progress bars. Unfortunately, using notify in a chain or promises is cumbersome since calls to notify do not bubble up. Every function in the chain would have to manually bubble up notifications, making code a little more difficult to read. The view renders normally, and when the promise is resolved AngularJS automatically updates the view to include the value resolved in getBio. When a promise is resolved asynchronously, “in a future turn of the event loop”, the .resolve() function must be wrapped in a promise. In the contrived example below, a user would click a button triggering goodbye(), which should update the $scope’s greeting attribute. Using promises is an important part of writing an AngularJS app idiomatically and should help make your code more readable. Understanding their shortcomings, and their strengths make them much easier to work with. 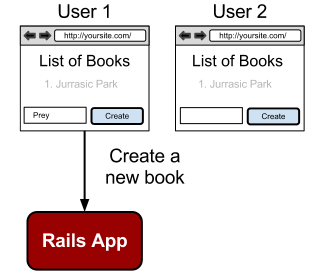 Over the past 6 years I’ve used Ruby on Rails, Backbone.js, Node and AngularJS. RoR reinforced my knowledge of Model View Controller (MVC) while Backbone.js did the same for my knowledge of Publish/Subscribe. 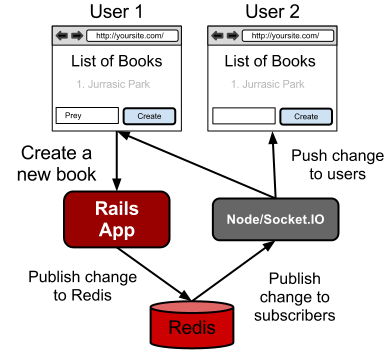 Like many who made the switch to Node, my first instinct was to try and apply MVC to my Node.js apps - however, it felt unnatural. Taking a “class”-based approach, using CoffeeScript, didn’t feel entirely natural either. This speeds testing up significantly and ensures that if the unit tests fails it’s not failing because of issues with the database code. Ultimately, this makes localizing bugs much quicker. In other words we can test just the creation of thumbnails, and not our database (which we’d do separately). DI forces one to think more rigorously about how code will be divided into modules, and what modules will be injected into other modules. This requires more diligence upfront, but leads to greater flexibility down the line. For instance, the database object is only being required() and injected in a single spot in the code, making it much easier to swap the database from say MySQL to Postgresql. Why not use use require? On a post detailing the magic behind AngularJS’ DI, tjholowaychuk (of Express.js, Jade and Mocha fame) asks: “why not just require() what you want? seems odd to me”? Despite asking 6 months ago, no one has replied, leaving readers pondering why. As the example above shows, requiring dependencies at the top of each file makes mocking more difficult. One could write a wrapper around each dependency, and serve it normally for development/production and serve the mocked version for test ENV, but at that point why not consider DI? My first impression of Angular.js was one of amazement. A small amount of code could do a lot. My worry with Angular, and other magical frameworks, is that initially you are productive, but eventually you hit a dead end requiring full understanding of how the magic works. In my quest to master Angular.js, I wanted to learn everything about creating custom directives - a goal that I’d hope would ameliorate the learning curve. Egghead.io does a good job exploring basic, and intermediate, examples of custome directives but it still wasn’t clear when to use the compile parameter in a custome directive. Miško Hevery, the creator of AngularJS, gave a talk about directives and explained that compile is rarely needed for custom directives, and it is only required for directives like ng-repeat and ng-view. So the next question: how does ng-repeat work? In my quest to understand the compile function, I started examining ng-repeat. Reading the source code was difficult until I walked through an example using the Chrome debugger. After stepping through ng-repeat it became clear that most of its 150 lines of code are related to optimizing, error handling and handling objects or arrays. In order to really understand ng-repeat, and specifically compile, I set out to implement my own version of ng-repeat, which I will call lk-repeat, with just the bare minimum of code. When possible I tried to use the same variable names that ng-repeat uses, and I also used their regular expression for matching passed in attributes. Before going further it’s important to review the transclude option. Transclude has two options: 1) true or 2) 'element'. First let’s examine transclude : true. In the above example transclude : true tells Angular to take the contents of the DOM element, using this directive, and insert them into the person’s template. To specify where in the template the HTML will be transcluded include ng-transclude in the template. The span, with class ng-scope is inserted by AngularJS. In contrast to the above example, ng-repeat, does not have a template, and transcludes the element that calls ng-repeat. Hence, ng-repeat calls transclude : 'element', to denote that the DOM element that called ng-repeat will be used for transclusion. Below lk-repeat is used the same way ng-repeat would be used. // create a new scope for every element in the collection. // clone the transcluded element, passing in the new scope. Above you’ll note that I’m removing all the elements from the DOM, and their scope, every time the collection updates. While this makes the code easier to understand, it is extremely inefficient having to remove everything then add it again. In the real version of ng-repeat, only elements that are removed from the collection, are removed from the DOM. Furthermore, if an item moves within the collection (e.g. 2nd to 4th place) it doesn’t need a new scope, but it needs to be moved in the DOM. Reading ng-repeat’s code gives me confidence that the team behind AngularJS has created a good, well tested and efficient framework. In part 2 I examine ngView, it’s implementation, hidden features and creating your own ngMultiView. You’ve created an app that your beta testers use and your launch was a huge success. Every day the number of registered users increases and you feel like you’re making progress and moving closer to your goals. It would be a mistake to hunker down and focus singularly on hammering out new features. Now that you’ve launched you have significantly more people visiting your homepage, creating accounts and using your app. You have much more data to help you prioritize what to do next. I’ll focus on three important metrics that are extremely important and especially so after launching. These metrics are all conversion metrics and include 1) vistors creating an account, 2) becoming an active user and 3) becoming a paying user. While there are exceptions, the order is important: a user can’t become an active user without creating an account. Likewise, paying users are most likely active users. Maybe visitors are arriving at your site searching for something else. If that’s the case you might have a high bounce rate (e.g. users coming to your site and immediately leaving). To fix this issue investigate ways to improve your SEO and ensure that your keywords are relevant to your product. Have you made it as clear as possible why your product is needed? Ask colleagues unfamiliar with your product to evaluate you’re site’s copy and it’s clarity. Have you made it obvious how they can create an account? To test this you can use a service like Optimizely to A/B test different variants of your front page and your call-to-action button. Maybe your pricing page is too complicated, or your prices are too high, and as a result users don’t even bother creating an account. This is an issue that you should look into before you launch. Ideally you should speak with an appropriate number of potential customers to figure out if your price is within a reasonable range. What percent of users become active users (e.g. use your app every day/week)? Your definition of an active user is dependent on your service. If you’re creating a new email app, or a social network, an active user might be someone who uses your app multiple times per day. If you’re creating a tax app, an active user might be someone who uses it once a year for a week. In order to measure active users first you must define who they are (duh!). Problem: users create an account and then never use your app again. It could be that you have a very interesting idea, but your implementation is off. Likewise you could be attracting a lot of curious users that have no intention of actually using your app, but just want to see what the fuss is about. I’d recommend following-up on a user if they haven’t used your app in a week after registering. Ask them why they didn’t end up using it, and what *one* feature they’d need to use it. Your response rate will likely be between 5 - 10% but hopefully that should be enough to pick up trends. If possible I’d automate this step to ensure that emails are sent out consistently and you don’t waste your time sending out copy and pasted emails. Problem: they use your app for a couple of weeks and then never use it again. While still bad, at least you have more data to work with. Check your database and determine what parts of your app they were using. For an email app, were they sending emails, but not creating contacts? Maybe creating contacts was too tricky and they gave up and stopped using your app. Analyze your data carefully and see if you can pick patterns that can point you to areas that need to be improved. Alternatively there could be temporal patterns, for instance, people who only use your app once a week quickly stop using it relative to those that use it several times a week. Finding patterns of use and comparing active users to non active users can shed further light on potential problems. What percent of your active users become paying users? Comparing patterns of use between users who’ve converted, and those who have not, in the same cohort is useful for elucidating causality in conversions. Unlike the previous step you should have much more data to conduct your analysis. More data means that it should be easier to find statistically significant patterns, but it may be more challenging and time consuming to do analysis. I’d recommend generating fewer than five hypotheses before you start your analysis. This will both limit the complexiy of analysis and reduce the multiple comparison problem (e.g. with enough comparisons you’re bound to get significant differences that are due to chance alone). Analyzing what your users are doing, why some are creating accounts, why some are becoming paid users and why others are not is extremely important. If you love coding, and adding new features, it can seem like a big time waster, however, doing the above will help you prioritize better. Although I haven’t tried either myself both Kissmetrics or Google Analytics’s Conversion feature should help you with the above. It’s crucial to be able to quickly determine why some users never become active, or never become paying users. Use hypotheses, data and outcomes to determine how to spend your time efficiently. Time is something you have little of, use it wisely. You’ve created a product that people want to use, and now you’re eager to launch. From my experiences launching Understoodit, in May 2012, I’ve compiled a set of steps that helped Understoodit get on several big sites including TechCrunch, Toronto Star, and BetaKit. If you have a large budget hiring a PR firm might be your best bet, otherwise the steps below will help you get started. If you’re going to catch people’s attention in an app saturated environment, it’s important to communicate what’s unique about your app. If you’ve created a todo app, is it for Doctors, Engineers or does it something truly unique? If you can’t figure out why your product is unique it’s going to be a tough sell and it will certainly make it more difficult to get the press interested on your launch day. The unique angle for Understoodit was focusing on its confusion feedback feature (students can click confused, and in real-time the teacher can see what percentage of students are confused). If I had said Understoodit was a “classroom response system”, I would have had a much harder time competing for attention. An important step in preparing for a launch is crafting a press release. If you’ve never written one, or you aren’t a strong writer, I’d recommend hiring someone to write it with you (Vicki So helped me). My familiarity with Understoodit made it difficult to objectively write about it. When you’re focused on the technical side of your product it can be easy to loose focus on what’s important to prospective users. By asking good questions, Vicki was able to tease out of me what was important about Understoodit and why educators might be interested. She was able to turn a product launch into an interesting story about how I started Understoodit. Reporters read many press releases each day, make sure yours is interesting, tells a story, and is well crafted. One of the most important tips Vicki gave me was: send the press release to a specific reporter, not a newspaper or website in general. A reporter who covers education is potentially more interested in Understoodit than the average person handling general enquiries. In preparation for launch I made a long list of reporters that cover education, and on launch day I emailed each of them a quick note with a press release attached. I’d also recommend adding reporters who cover small business and startups to your list, they may also be interested. In addition to reporters, I contacted a couple local tech bloggers and asked if I could give them a face-to-face demo. This approached allowed me to pitch a reporter at BetaKit, a Toronto-based website that covers startups. They ended up doing an article about Understoodit a day after the launch. I’m no social media expert, but I can say it played an important role in the early success of Understoodit. Facebook and Twitter were huge sources of traffic, as were social news sites such as Hacker News. Depending on your product’s niche you might have more luck with other social networks such as Pinterest or Instagram. However, for you to have a big impact on sites like Twitter, or Pinterest, it helps to have a lot of followers. Gaining followers takes time and is something you should consider long before you launch. I owe a lot of Understoodit’s launch success to friends that not only helped me with the press release, but also tweeted, liked and voted up Understoodit on launch day. Friends and family are also critical in getting you over the trough of despair - so be kind to them! No matter how prepared you are there is a strong component of luck to a successful launch. Was your press release the first that a reporter read, or did they read it after reading 5 others? Was there a major news event on the day of your launch? Did a writer on TechCrunch see your launch on Hacker News? All those things are mostly out of your control but can greatly affect your success. Preparation can mitigate some of those issues. For instance, it’s always a good idea to see if there might be any important news events, or tech announcements, that could overshadow your launch. After following the above actions, mixed with a healthy dose of luck, I was on the front page of Hacker News, and later that day on TechCrunch. Over a 24 hour period Understoodit received hundreds of registrations. Ultimately, that initial burst of excitement made it possible to get an article in the Toronto Star and the Chronicle of Higher Education. Next Week: I will cover 3 important metrics that you need watch after launching your product. You’re a talented developer and have a great idea for a startup. You’ve read The Lean Startup, you’ve attended entrepreneur events, and you read Hacker News. At this point you’re confident that you’ll be able to build a compelling product while avoiding common startup mistakes. Unfortunately, that pretty much summed up my (immodest) perception of myself prior to launching Understoodit.com. While the May 2012 launch of Understoodit was more successful than I anticipated, there were certainly things I could have placed more focus on prior to launching. Below I’ve informally divided the pre-launch process into 5 stages: 1) finding customers, 2) the one feature, 3) early beta testing, 4) engaged users, and 5) time to launch. It’s an increasingly common sentiment that you should find potential customers before you start building a product. If you have difficulty finding customers at this stage it may not get easier when you’re coding 12 hours a day. In my experience it’s easier to get help from potential customers at this stage since you aren’t necessarily selling anything yet. At this stage you’re simply doing research and building relationships with potential customers. When contacting professors for Understoodit, I found they were happy to give feedback and provide constructive criticism. If initially I had tried to sell them something, they may not have been so forthcoming with help and criticism. If all goes well, those first few relationships will turn into paying customers, so be kind and accept their feedback without becoming defensive! Assuming you’ve mastered the previous step, getting feedback will be easy. In fact you’ll likely end up with a laundry list of features. Some features are nice to have, while others will be critical. Unfortunately teasing apart the critical features from the nice-to-haves is not always easy . I’d recommend asking potential users: “If we added only one feature, what would be the most important?” This will force your users to prioritize what they think is the most important feature. A single user may not get this right, but the intuition of multiple users should converge on a single feature. That single feature will become your minimum viable product (MVP). Furthermore, if your users thought that feature was very important, it’s likely that others, in the same demographic, will also think it’s important. At this stage you’ve created an MVP, with one critical feature, and you’re eager to start early beta testing. There is a lot of good advice on user testing online, so I’ll focus on one method that I’ll dub “passive watching”. Passive watching involves sitting with potential users and passively watching them create an account, use your app, perform various actions, etc. It’s important not to help them at this point. Rather, what you want to do is see where they’re getting stuck, where they’re getting frustrated, and where things are working smoothly. Don’t be defensive if they dislike the user interface, or its flow, just listen at this stage. After testing with 10 - 20 potential users, you’ll get a very good idea of what needs to be improved, removed and what needs to be added. During early beta testing you hopefully received a lot of positive feedback. (And thanks to many who gave me feedback, including readers of this blog.) But don’t conflate positive feedback with engagement. Just because a user says your app is great, it doesn’t guarantee that they will actually use it, let alone pay for it. However, if your early beta testers keep using it, and start telling their friends, then that’s a good sign. On the other hand, if they stop using it, it’s critical to find out why they’re not using it. If you can’t engage your early beta testers (that is, users who’ve invested a lot of time already), it will be difficult to engage new users after launch. This stage is important! So don’t fool yourself into thinking you’ve created a great product unless you have engaged users using your app regularly (self awareness and introspection are important attributes for entreprenuers ). If your users aren’t engaged you have to decide whether to go back to early beta testing, pivot, or scrap the idea entirely. You’ve built a strong MVP that is used regularly by your beta testers. In turn those testers are telling friends and colleagues about your app. You’ve validated both your idea and your execution and it’s time to launch and grow the number of users. Next week I’ll cover some of my experiences that helped get Understoodit featured on TechCrunch, Discovery.com News, The Chronicle of Higher Education, and the Toronto Star. Following next week’s article, on “The Launch,” I will focus on metrics that will help you decide if your startup is succeeding or floundering.